I watched the social media reports this week from Blog World and New Media Expo in Las Vegas with intense interest. LiveStrong CEO Doug Ulman, a leader in two areas near and dear to me — social media marketing and cancer survivorship — was one of the keynote speakers. Seems hard to believe, but I met Doug through Twitter. I sent him a direct message when he was just setting up his account in 2008. The message contained a link to a post on our family and friends blog. The post shared the story of my wife Tami Boehmer, who is battling Stage IV breast cancer. Tami had started interviewing people for what would become From Incurable to Incredible: Cancer Survivors Who Beat the Odds. She asked if Doug, a three-time survivor, would like to share his story. He graciously agreed. It became the foreword, and we decided to donate a portion of the proceeds to LiveStrong. LiveStrong helped Tami find some of the 27 people in the book. I share this story to show you how Doug “walks the talk” when it comes to social media. He has used Twitter, mostly, to engage and mobilize nearly 1 million followers — including me. Doug is a sincere, kind person — and we get to stay connected to him through his daily tweets. We read about his meetings with survivors, supporters and celebrities. We get tidbits about his personal life (checkups, workouts, ties with Ohio State’s president, family in Maryland…). We learn about LiveStrong’s priorities. He really follows the formula espoused by my friend and super social media marketer Kevin Dugan — mixing personal, promotional and sharing of useful information. To learn more about his talk at Blog World, please see blog posts from Rohit Bhargava, Rob Cottingham and Sue Anne Reed. 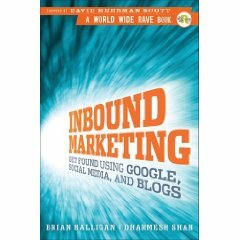 While talking social media with a Cincinnati PRSA colleague over a cup of coffee this week, I strongly recommended that she read Inbound Marketing: Get Found Using Google, Social Media, and Blogs by Brian Halligan and Dharmesh Shah. She stopped by the public library on the way back to her office — and learned that all five copies had been checked out. No surprise to me. Inbound Marketing stands out among the many social media books, white papers and eBooks I’ve read. It goes beyond selling readers on the importance of moving into the new world of marketing and PR and offers how-to advice on implementing strategies and tactics. It’s written by two people who obviously walk the talk. They have learned first-hand what works and what doesn’t. Halligan is cofounder and CEO of HubSpot, a marketing software company that helps businesses get found. He is a former venture capitalist and seasoned marketing executive. Shah is cofounder and CTO of HubSpot. He is a serial entrepreneur, angel investor, and authors the OnStartups.com blog. He speaks frequently on the topics of marketing and entrepreneurship. Halligan and Shah set the stage by describing the revolution occurring in marketing — from an interruption model based on advertisements, telemarketing, direct mail and the like to an inbound method where potential buyers opt-in for content. They walk readers through the myriad of online tools such as blogs and social networks. They show how to optimize content to get found in search engines. They spell out processes for attracting prospects and funneling them into buyers. If you’ve read this book, what did you think about it? What stands out to you? If not, I’d suggest you pick one up — maybe buy one instead of waiting on a library copy. Your competitors may be getting ahead of you! If you viewed the video above, you saw a testimonial — comments from the mom of a young child being treated for leukemia at Cincinnati Children’s Hospital Medical Center. The mom tells how my wife Tami’s book, From Incurable to Incredible: Cancer Survivors Who Beat the Odds, provided much-needed hope and inspiration. A friend shot the video clip at a book-signing event at Borders in Mason, Ohio. She captured the remarks using a Flip cam. The comments made all of our work on Tami’s book worthwhile. The thought of the mom sharing the stories from the book with her daughter made the hours of researching, writing and marketing the book worth it.